Monique's Salon combines advanced technology and uncompromising quality to create a Hair Replacement that is incredibly similar to natural hair and scalp, a virtual duplication of your own natural growing hair. The basic reason Monique's Salon is better than any other method of hair replacement is that our hair restoration techniques are much more realistic; much more like natural hair. This is the important difference between Monique's Salon and others. In a natural head of hair, each hair grows out of the scalp at a specific angle, and is held at that angle by the hair follicle. We developed a unique method of implantation that allows us to duplicate this angle, giving you the natural bounce of a healthy head of hair. Of great importance is what is perceived to be under the hair or at the scalp level of any Replacement method or procedure. Our latest advancement is perceived as nothing but the skin on your scalp with a proper amount of hair growing from it. This is in extremely close visual inspection, and also to the touch, ranging from casually friendly to passionately intimate. Style possibilities are practically limitless, and our hair restoration services are designed to give maximum flexibility in styling for clients. If you need advice on style, however, we are happy to help. 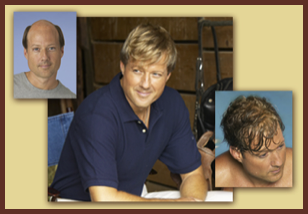 Monique's Salon offers a non-invasive hair graft, as one of your options in hair restoration. Through our technique, a non-invasive hair graft acts as a second skin, actually becoming a part of you. There is no surgery and the process is simple. There is no daily care, no special treatments, just a regular daily shampooing like your own hair. Not only does it look great, it is easy to take care of and you can enjoy all your favorite activities. It will not change your lifestyle, but it may change your life. Monique's Salon offers custom units made from human hair, synthetic and cyberhair. Each unit is made with your lifestyle, budget and needs in mind. We help you to obtain the best possible option for you.